@lmasri: Tell us about your untraditional path into Product. @ceceliashao: How do you move mobile design away from the mindset that it’s just a subset of desktop design? @junloayza: Can you tell us about your team, how you discover opportunities and prioritize your roadmap? 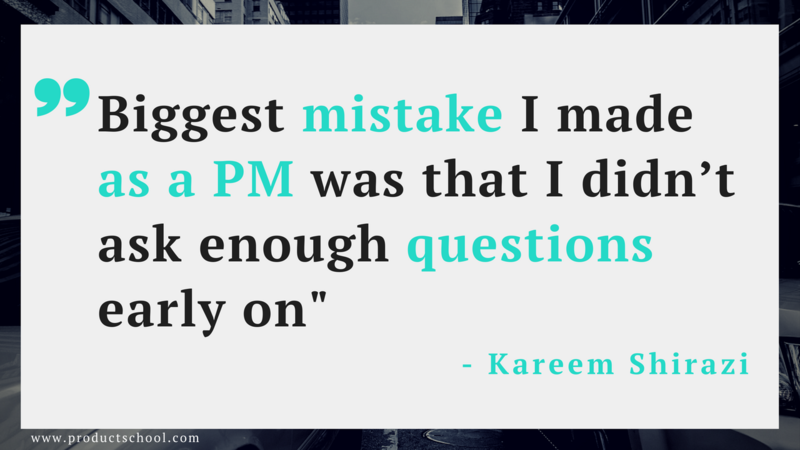 @salome: What are the biggest mistakes you’ve made as a PM and what lessons you learned from those mistakes? @twang: When triaging urgent production issues, how do you prioritize which is more important? 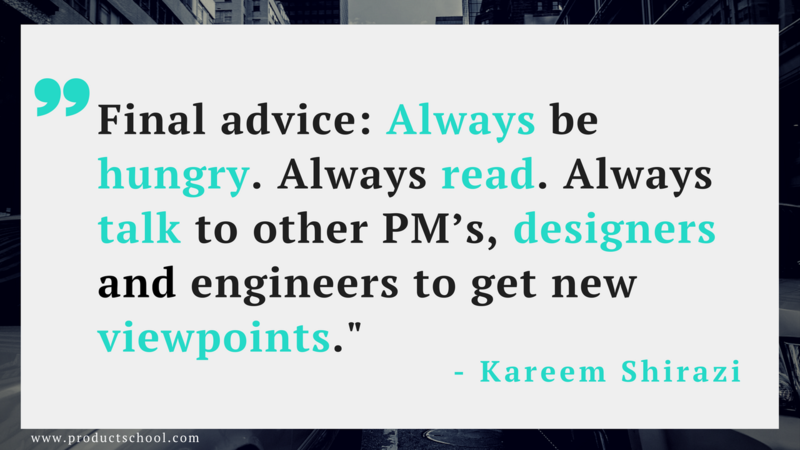 @samhart: How did you acquire the technical chops to speak fluently with engineers? @faye_shi: How does Jet acquire its users, and the metrics they use to measure the acquisition performance? @ezeagwulae: What is your approach when joining a new PM team and how do you navigate the first 15-30 days? @tenagne: Can you tell me about some of the pure product management parts? @carlosmiguelp: What makes a great PM? What is the interviewing process at Jet like? @drakeopolypse: Do you manage other PM’s or the development team? 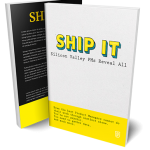 What constitutes an untraditional path into product? There is no answer for this question but there are about as many stories of people breaking into product as there are different backgrounds. 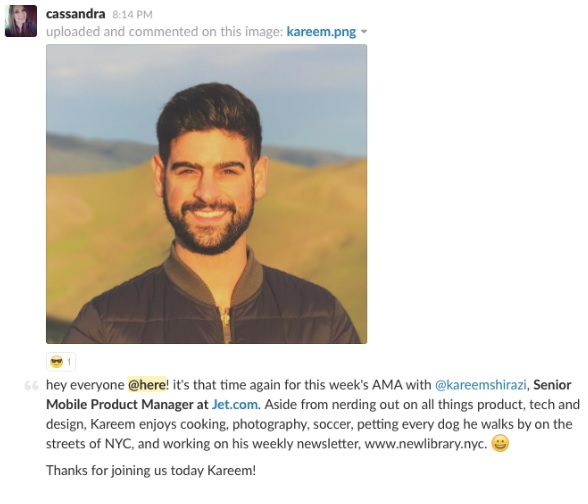 The Product Manager at Jet.com, Kareem Shirazi, was asked to sit down in front of his laptop and answer questions from our product management community. Here’s what his road to product was like. I started by working at a company called CAA (Creative Artists Agency). They are one of the world’s largest talent agencies. I then moved to a digital media company, Fullscreen, which is where I fell in love with product. I was exposed to it in an awesome startup-y environment which also helped. After navigating that company, I landed on their internal tooling team, informally, but ran with it for as long as I could. Then I realized I wanted to move to a B2C team, customer facing. That’s when Jet popped into the picture, and I’ve loved it ever since. Something to remember is that there is no defined path to product. 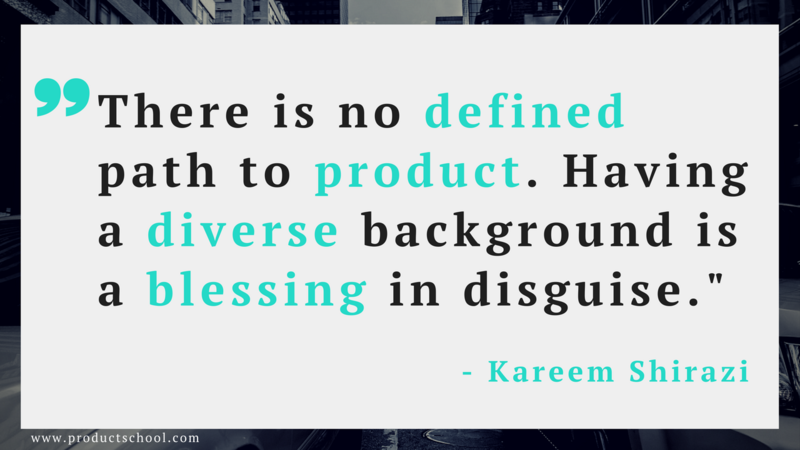 Having a diverse background is a blessing in disguise. You can pull the unique knowledge from your past jobs, that may only be tangential to product, to help you build unique and delightful products. We’re actively going through this right now! Since Jet’s inception, we have done just that – translated desktop/mweb design into native. And that’s not the right approach. We noticed that our app user had much different behavior than our desktop/mweb user, and our design did not lean into that user’s needs. It’s important to understand context when designing and building an app so that you make the right decisions for your user. We explored the iMessage App feature last year and built a cool “shared cart” app where you can collaboratively build carts with your friends straight from iMessage. Unfortunately, it was hard to discover, but we liked the idea of shared carts, so we’re exploring how to bring it to the main app experience. Our native team is comprised of 5 iOS devs, 2 Android, two dedicated UI/UX folks, and 2 PM’s. We are adding a couple of more engineers and a dedicated analytics people to the team soon. Since Jet got acquired by Walmart late last year, we’ve been doing some “soul searching” on the mobile team and what came out of that was that we determined that autonomy was important for us (and ultimately for our users). Mobile users have different needs, so we needed to divorce ourselves from the web roadmap. We typically do user research (in our house lab), usertesting.com and deep dives into our analytics. A lot of features are still “table stakes” so the innovation chapter is just beginning, which I’m super excited about! Biggest mistake I made as a PM was that I didn’t ask enough questions early on. Learnt lesson: don’t be afraid to ask a lot of questions. People think that asking questions makes you look dumb, but I’d argue assuming things makes you look dumb. Asking questions is one of the most liberating things you can do early on because you can surface bits of knowledge you wouldn’t otherwise gain without asking those precise, well thought out questions. Typically when we have major production issues, it’s an API issue (not to hate on the API! ), but we don’t really allow ourselves to get into a situation where we release something client-side that can cause so many problems. We write unit tests for every feature and manual QA from our in-house team. 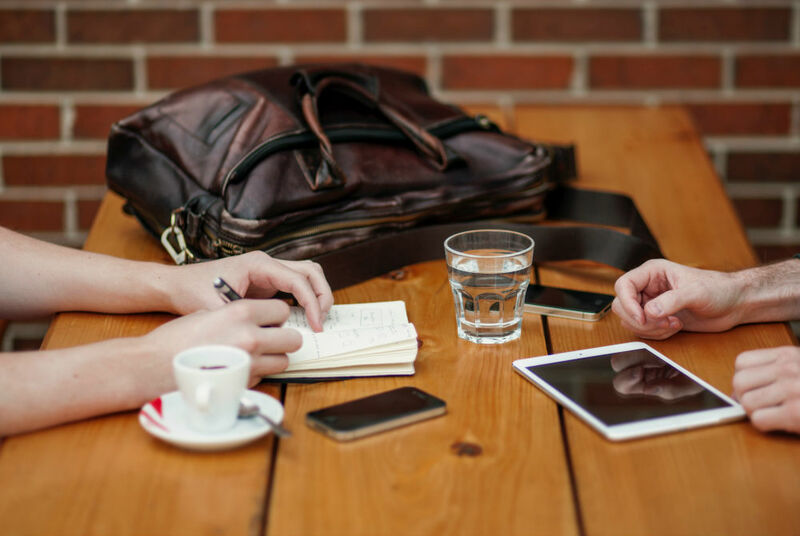 We adjust the sprint schedule to accommodate for any issues – everyone is aware that things may get pushed when we have big issues. This puzzled me for a while when I started, but ultimately I found that being “technical enough” is all that is needed. It doesn’t mean that you’re writing code and making commits. You should have the right amount of knowledge for how the API is structured and works, and just enough knowledge for how the clients are built. This way when you are in a meeting with e.g. marketing you can tell them that the promo code feature they’re asking for doesn’t take a week’s worth of work but in fact three weeks. Another thing I did early on at Jet when I was on the web team was slowly built trust with the front-end engineers by asking them to take over menial parts of their job (we were a scrappy startup after all.) This means that there were things like on-site copy updates. We use a variety of channels to acquire users: mweb banners deep-linking into app/app store, Ibotta, targeted ads on social networks, subway ads, tv, etc. The biggest metric the growth team monitors is cost of acquisition. Once we convert a user (downloads the app) we see if that traffic source was trash (meaning they don’t ever make a purchase) or if that traffic source provides us with users with great intent. We monitor, refine, rinse and repeat. I’m reductive, but that’s the super high level. I think the best thing to do early on is set up time to chat with all the engineers and designers you’ll be working with. There will be a learning curve, and it will last anywhere between 1-3 months so just expect that (and if you’re at the right company, they will too, so don’t stress about it) really digging deep and understanding the technology stack and how everything works together is invaluable knowledge. And for design, being able to understand the principles, design library, and the approach when ideating on new features will help when you introduce new ideas and features. Jet was a bit of an anomaly in that we were brought into existence by someone who is an expert at the e-commerce game (Marc Lore) so the go to market was more around brand positioning. How we were different from Amazon/Target/Walmart, and what our specific value prop is (price drop as you shop). Hammering those home were mainly on the marketing side, and product/UX had influence over that in a meaningful way. It’s a beautiful cocktail of opinions and expertise that eventually give birth to your product. The app was a second class citizen when we launched (we had one eng for ios and one eng for Android) so we were just constantly playing catch up, but for jet as a whole, the KPI was GMV (gross merchandise value). 1. Is well versed in tech-design-marketing, meaning you should be able to speak those languages. 3. can see the forest for the trees, meaning discerning an overall pattern from a mass of detail. Jet interview process tests these, but we also are HUGE on cultural/value fit because the human element of all of this is too important to forget. A huge part of my role is managing people, and honestly, it’s one of my favorite things about the job. I manage a team of developers and designers. I work with engineers constantly to refine our process to make sure we’re following processes that everyone feels comfortable with. It’s all about collaboration, don’t make decisions in a vacuum, always take people’s input and whip that together to form something great for the team, whether that’s a feature or a team org design decision.